Last night was Friday the 13th, and I was hoping to get lucky with the crescent moon as it was going down in the western sky. Catching a crescent moon at twilight is kind of tricky, because you have several factors to consider. For example, if you want to capture the rising crescent, you will be shooting at dawn a couple days before the New Moon. If you want a moonset, then it will be at sunset a couple days after the New Moon. Other factors include the location of the moon on the horizon, size of the crescent, and the time of the setting or rising sun. All of these can be determined with one of the various smartphone or tablet apps such as The Photographer’s Ephemeris (TPE). Most of the factors looked promising for the crescent after sunset on the 13th. It was two days past the New Moon and, according to TPE, it would be lined up fairly well with the Jefferson Memorial with the Tidal Basin in the foreground. The size would be a little smaller (<5% illumination) than I would have liked and a bit higher in the sky (9 degrees), but otherwise there seemed to be a lot of potential. So I headed down to the Tidal Basin to see what would happen. I started shooting about 10 minutes after sunset and stopped about 55 minutes after sunset. The best results were at about the 35 minute mark, seen above. Those looking closely will see the three spires of the USAF Memorial on the right side of the image. 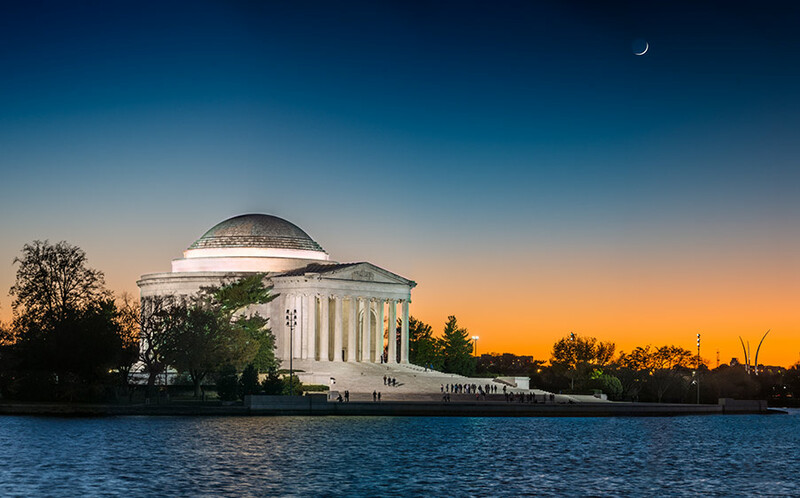 This entry was posted in Magic Hour, Moon, Night Photography, Photography, Washington DC and tagged Jefferson Memorial, moon, Photography, twilight, Washington DC by Robin S. Kent. Bookmark the permalink. Thanks, Susan. Yes, the colors were nice. I was a little worried about the clear skies when I got there but, as often happens, Mother Nature had something special in mind. Very nice Robin the Crescent really perfects the photo in my opinion, nicely planned. Thanks, Kenny. I appreciate your comments. beautiful work! such luck for Friday the 13th! Thanks, Janice. Yes, it really worked out well. And I was the only one out there with a tripod. Quite different than seven months ago when the cherry blossoms were at peak. you are one of the few I know that follows the moon, and plans for placement in your images. just one of the things that makes your images special. Beautiful capture! I finally added TPE to my arsenal, but haven’t experimented much with it yet. It certainly can be helpful with planning a shoot. Thanks for the comment. Yes, the TPE app can be a big help in finding opportunities. An upcoming opportunity for practice is the full moon on November 25. Thanks! I appreciate your visiting and your thoughts. Thanks for the info about TPE. I don’t think I can ever learn that, but still I like to know just in case. Ha. Thanks, Laura. Yes, the evening sky was very special that night.